Zadar (Croatia) Sep 14 (IANS) World No. 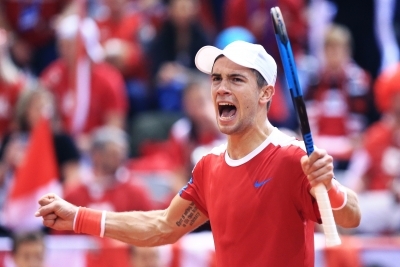 18 Borna Coric of Croatia on Friday gave his country a 1-0 lead over the United States at the opening singles match of the David Cup semifinals. The 21-year-old Coric took two hours and 24 minutes to beat the US Steve Johnson 6-4 7-6 (7-4) 6-3 at Sportski Centar s outdoor clay court in the Croatian city of Zadar reports Efe. The tie will continue on Friday as Croatia s Marin Cilic takes on the US Frances Tiafoe. The winner of this tie will take on the victor of the other semifinal clash pitting defending champion France against Spain in the final to be held on November 23-25.